Rays of Hope in close cooperation with Camphill’s Management conceived the “Solar Rays” PV project under socio-ecological objectives. The initial PV capacity was set to 60 kWp to provide reliable energy primarily for the dairy, which is Camphill’s main electricity consumer with a peak demand of 32 kW and an annual energy consumption of 85,000 kWh (2015 data). Surplus PV generation feeds loads in adjacent buildings or is being stored in the dedicated battery bank. For security reasons the roof mounting option of solar modules was selected. Extensive strengthening of the barn roofs as well as extension works were necessary for the accommodation of the PV modules. The high-level design and the sourcing of the components were undertaken by Rays of Hope while the logistics support, detail engineering, implementation, commissioning, testing of the plant was expertly provided by Sieckmann Engineering, Constantia who continue to support the operation and maintenance phase. In alignment with available funding, the execution of the project was broken down into distinct phases. 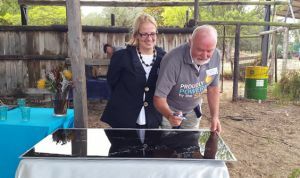 The PV plant was handed over to Camphill in March 2014 in the presence of representatives of the City of Cape Town as well as the German Embassy, local media and project sponsors. During this phase 300 First Solar FS-367 TFT modules with unit capacity of 67,5 Wp, SMA inverters, BAE batteries and cables were installed. Schletter donated the necessary mounting structures. The completion of this phase allowed taking the dairy as well as some houses largely off-grid. The successful implementation of “Solar Rays 1” and the exemplary performance of the PV plant demonstrated RoH’s capability to realize projects of this magnitude and complexity in an environment, which at times poses administrative and logistic challenges. Much of the electrical infrastructure implemented Phase 1 was shared and 400 PV modules of unit capacity 97.5 Wp were additionally installed. After system tests resulted in most satisfying results, the plant was handed over to Camphill Village on 30 October 2015. The plant operates from 06:00 until 20:00 and reaches a peak output of some 58 kW. This is an excellent result considering that factors such as the temperature coefficient, conversion losses, atmospheric conditions and orientation of the installation affect the performance of an array. The daily plant performance - monitored online via the Sunny Portal - is available to the sponsors for inspection. During the 12 months’ period from November 2015 to October 2016 the plant produced 108,500 kWh which is above expectation. • The replacement of the original 300 modules of 67.5 Wp unit capacity by 300 state-of-the-art modules with unit capacity in the order of 280 Wp thus increasing the total capacity from the current 20 kWp to some 90 kWp. The 40 kWp placed on the barn extension during Phase 2 would remain. • Placing PV modules of capacity in the order of 20 kWp on roofs in the enterprise area. • Transferring batteries from Europe to Camphill Village for backup of excess PV generation. Work on the above-mentioned enhancement of PV generation is earmarked for the year 2018. Thank you to all the sponsors involved in this project. It really is making a huge difference!